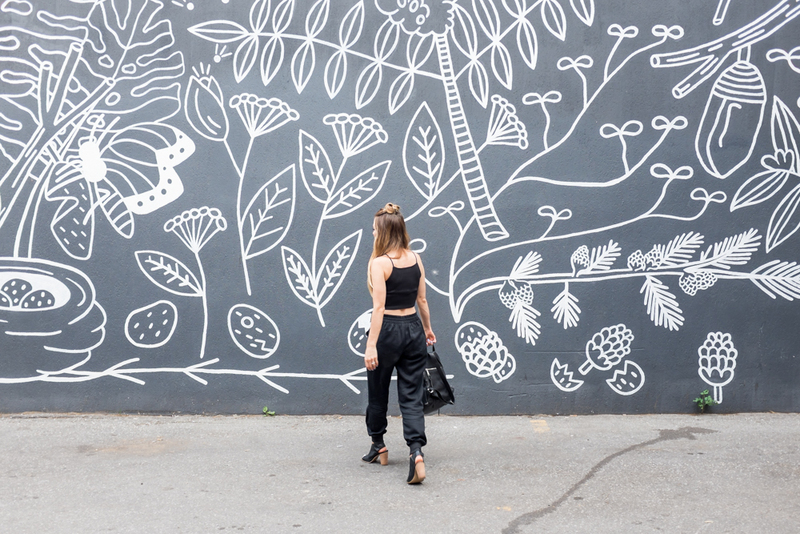 OOTD - Urban Ninja | La Petite Noob | A Toronto-Based Fashion and Lifestyle Blog. When I first stepped out in this all-black outfit, my husband Brian told me that I looked like an 'Urban Ninja.' I'm not sure what that's supposed to mean, but I'll take it as a compliment - and steal his material to title this blog post, no less! Not one to gravitate towards black in the summertime, I make an exception when the material is light and the cuts are more revealing. 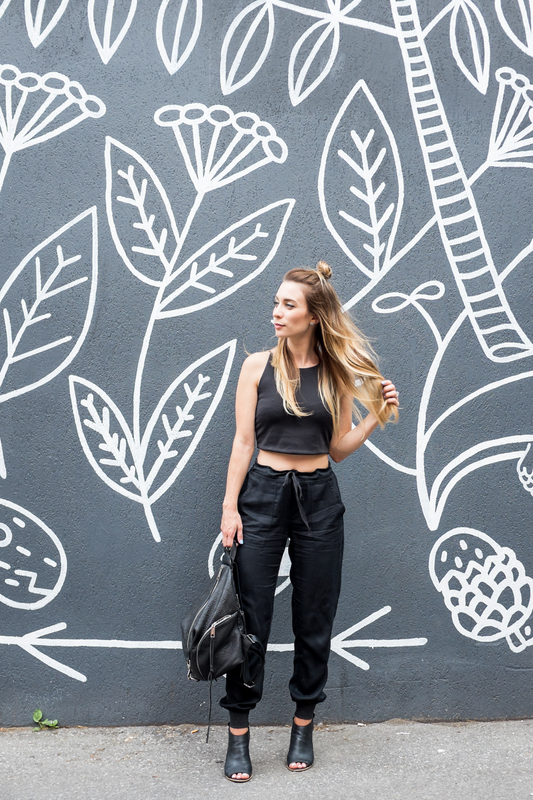 I've been absolutely in love with these baggy black jogging pants, and love to style them with more feminine pieces to give the outfit balance - enter the crop top. Add my favourite chunky-heeled toeless booties and the 'urban ninja' in me is satisfied - I guess. It's hard not to feel like you're wearing PJs when wearing track pants in public, in the best way possible. I actually call these pants my 'airplane pants' since they are absolutely perfect for travel - light, comfortable and breathable. I think that I can officially say that I've embraced the crop top, as long as it's paired with a high-waisted bottom. The rule of thumb that I follow is to not show your belly button, it just makes wearing a crop top way more comfortable. 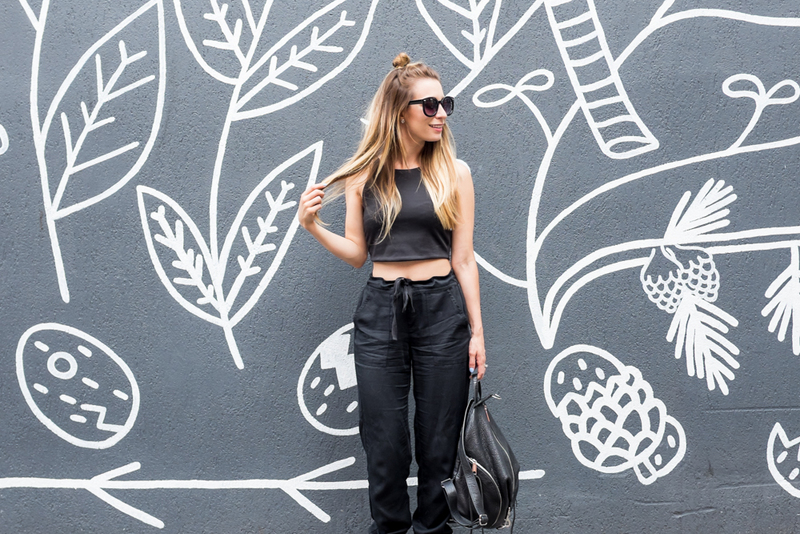 Are you guys digging the all-black look for the summer? How do you feel about wearing jogging pants in public? Let me know! i can totally see the "urban ninja" here but i seriously love it. i think the pants are perfection and the crop top fits so well. Thanks Andrea! I'm definitely loving the crop tops this summer, especially with the crazy heatwave we've been having! Thanks Carly, I'm glad that you like it! Look at you! Such a hottie! You're really ROCKING this urban ninja Joelle! and that wall is a sweet background, so perfect for this style!!! LOL looks are deceptive in this case! This is by far my favourite outfit to date! Casual but your style game is strong! Thanks girl, I'm glad that you like this one!